That's right, kids, even my camera bags are obsolete. 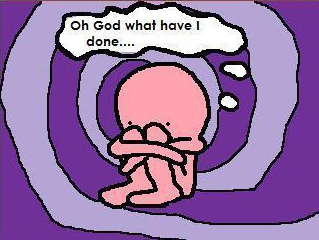 Also I'm writing an article on a camera bag, which is the last thing I thought I'd ever do (literally; as in right after doing so, committing suicide out of shame). 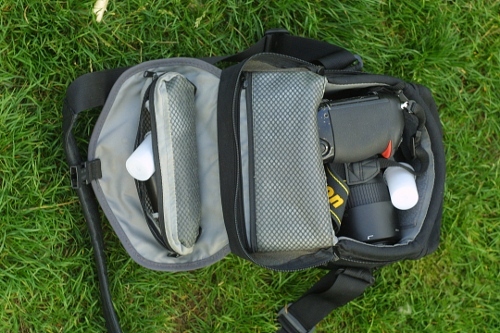 Thing is, though, I like it that much that I'm willing to write an article on my website about a boring camera bag. 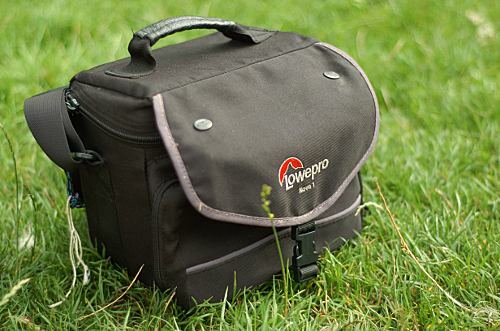 So yup, here's the Lowepro Nova 1, a tiny and Tardis-like camera bag which I've been using all the time for the last six months. For lugging around a massive camera like my D2H, it's saved me a lot of sore necks and sore shoulders. The main compartment of the Nova 1. There's actually two removable section dividers; I removed one because it got in my way and I lost it from there. 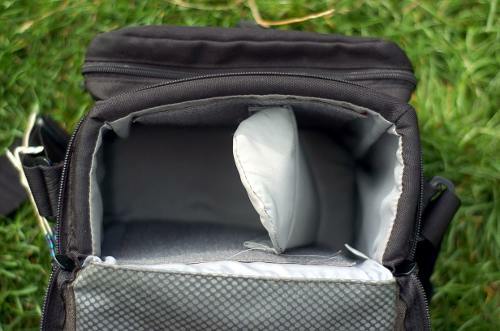 The main compartment: It's got two Velcro-removable dividers. It's about the right size for something smaller than a big pro camera, fitted with a normal lens, plus enough room to comfortably fit in a small telephoto like a 135mm, or perhaps a decent-sized flash gun. If you're carrying your camera, capped, without a lens (don't do this), you could easily get another lens or two in there. The front compartment: I usually use this to store film. It's also just about big enough for a little camera like an Olympus Trip 35 or Konica C35, one of which I often carry with me because they're so fun. The two compartments in the top flap: These are about right for a few rolls of 35mm film, or your memory cards if you carry spare ones (incidentally, I don't). The rear compartment: This is for flat objects, like your camera manual, or maybe your lens cloth. I use it to carry a photograph of my dog. The dog-photo compartment on the rear of the Nova 1. Excellent. I would happily (and have) carried this around while on my feet for ten hours at a time. Excellent, as if anything less could be expected of a Lowepro bag. Plenty good enough; lots and lots of padding. I suspect from the dense nylon-ish material that it'll be shower-proof too. I've been caught out in the rain once and didn't get the camera wet, so make of that what you will. Nope. It's not as bad an invitation to be a crime statistic as, say, a bag with "Nikon" marked on it would be, but the name "Lowepro" screams "HELLO I HAVE A CAMERA PLEASE STEAL ME". If this bothers you, stitch a My Little Pony patch over it or something. I'm tempted, but only because I think it would be hilarious carrying a Nikon D2H in a My Little Pony bag. Picture unrelated, but it breaks up the text. How much can you fit into it? Main compartment: Nikon D2H with mounted 55-200mm VR and 18-55mm buried underneath. Front pocket: Nikon 50mm f/1.8D and an Olympus Trip 35. Top pocket: three 35mm film canisters. Anything smaller than a D2H wouldn't be such a squeeze, so if you want to get an averaged-sized pick-up truck in there, you're golden. Main compartment: Canon A-1 with a 35-70mm lens lens cap (buried), Canon 135mm f/3.5 (buried), Canon FD 28mm f/2.8 (buried), Olympus Trip 35, Konica C35, Canon Power Winder A, and my ten-year-old Nokia 7110 (even my cell phone is obsolete, baby). Front pocket: Pentax ZX-M with mounted 28mm f/2.8 (! ), asthma inhaler. Top pocket (not shown): three 35mm film canisters. Back pocket: photograph of my dog. 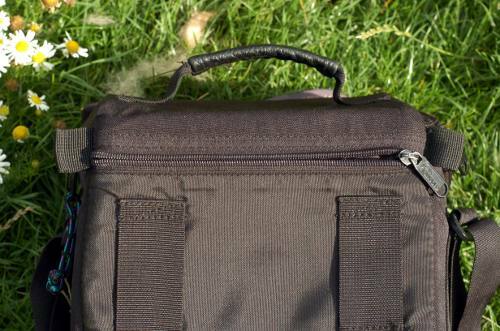 Don't be deceived by this bag's small size; that little space goes a long way. Honestly, I never carry this much stuff these days, not even when I'm shooting multiple cameras. Just as building wider roads never leads to less congestion, if you carry a bigger bag then this you will find yourself filling the space. Carry a little bag and you'll be amazed at how little you'll miss. Long, fast telephotos are way out of the question, sorry. Obviously, you can't carry a tripod in it, either, which is good because that means you'll leave your tripod at home. These come up on eBay from time to time. I paid £10 for mine, used. If you can't find one, today's Nova 160 looks like it's about the same size. This is one of two things I have never regretted buying for so much as a moment. If you don't already have a small camera bag and you run into one of these, get it.